On 17 June 1972 five burglars were arrested in the Democratic party headquarters in the Watergate apartment and office complex in Washington. The burglary was the culmination of a series of political dirty tricks that had commenced in the fall of 1971. The White House arranged for operatives to disrupt the primary campaigns of presidential hopefuls Senator Edmund Muskie of Maine and Senator George McGovern of South Dakota. They stole documents, planted false news stories, sent out forged letters on campaign stationery, and spied on campaign headquarters. These activities were approved by Attorney General John Mitchell, chief of staff H. R. Haldeman, and presidential counsel John Dean. Mitchell and Dean also approved a plan drafted by one of the Plumbers, G. Gordon Liddy, for an operation to break into, and wiretap, the headquarters of the Democratic National Committee. Liddy was given $83,000 in cash from the Committee for the ReElection of the President (CREEP) for the operation. On Memorial Day weekend, a group broke into the Watergate to search for information and plant the wiretaps. A second break-in, on 17 June, to replace a faulty tap, ended with the arrest of the five burglars who had been hired for the job. By 20 June, Nixon had been informed of the ties between the arrested burglars and the White House and discussed the matter with Mitchell and Haldeman. On 23 June, Mitchell and Dean recommended to Haldeman, who then recommended to Nixon, that the CIA be used to obstruct the investigation of the burglary by the FBI. Nixon agreed that the CIA should let the FBI know that the investigation involved a national security matter. The president had become implicated in a cover-up and conspiracy to obstruct justice. The CIA refused to carry out the presidential directive, and the FBI investigation moved forward. 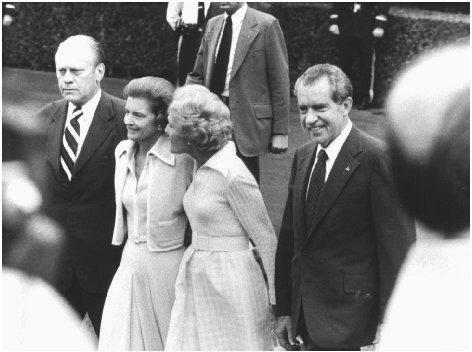 Richard Nixon (far right) is accompanied by Gerald Ford, Betty Ford, and Pat Nixon on the south lawn of the White House on 9 August 1974, the final day of Nixon's presidency. contained through the election, which Nixon won in a landslide, gaining 60.7 percent of the popular vote and 520 of 538 electoral votes. Early in 1973 the dam broke. In January the seven Watergate defendants went on trial. Federal Judge John Sirica postponed sentencing after they were found guilty. Prosecutors urged them to tell the truth before sentencing. During the next two months, stories of illegal campaign contributions surfaced, as well as indications of dirty tricks by various government agencies. On 23 March, Nixon met with Dean to discuss continued payoffs to the burglars. Soon thereafter Dean decided to disclose White House involvement to Justice Department prosecutors. Nixon then fired Haldeman, Ehrlichman, Dean, and Mitchell (formally accepting their resignations) and claimed that he had known nothing of the initial crimes or their cover-up, although he would take "full responsibility" for Watergate. His new attorney general, Elliot Richardson, was given authority to appoint a special prosecutor. In March he selected Archibald Cox, a Harvard law professor, to head the investigation, and issued guidelines promising the prosecutor full autonomy in pursuing the case. In May the Senate Select Committee on Presidential Campaign Activities (known as the Ervin Committee after its chair, Senator Sam Ervin of North Carolina) began its nationally televised hearings. Between 25 and 29 June, John Dean testified, claiming that the president had been involved in the Watergate cover-up. But his testimony could not be corroborated, and it was conceivable that he was merely trying to save himself. Then, in July, Alexander Butterfield, a former White House assistant, revealed that the president had used a taping system to record all conversations in the Oval Office. Dean's charges could thus be proved or disproved. From that point on, the key issue was access to the tapes. President Nixon refused to release them to the Ervin Committee, the special prosecutor, or the press, claiming "executive privilege," the right to maintain the confidentiality of presidential conversations. The Ervin Committee lost a federal court case seeking access to the tapes. The special prosecutor, acting on behalf of the federal grand jury investigating Watergate crimes, also sought access to the tapes and rejected a compromise whereby Nixon would provide only a summary transcript. When Cox rejected this compromise, Nixon ordered Attorney General Richardson to fire Cox. Richardson refused and resigned. The same order was issued to Deputy Attorney General William Ruckelshaus, who was fired when he refused to obey it. Finally, Solicitor General Robert Bork was named acting attorney general, and on 20 October he carried out Nixon's order and fired Cox. The firing was subsequently ruled an illegal violation of Justice Department procedures by a federal district court in Nader v. Bork (1973). These resignations and firings, known in the press as the Saturday Night Massacre, led to the first calls, in the media and in Congress, for the impeachment inquiry. Attempting to salvage his position, Nixon was forced to agree to the appointment of another special prosecutor and to an agreement concluded with congressional leaders that he would not fire the prosecutor without their concurrence. Leon Jaworski, a distinguished Texas attorney and former president of the American Bar Association, was chosen. By March 1974, former Attorney General John Mitchell and seven former White House aides, including Haldeman, Ehrlichman, and Dean, had been indicted on charges of conspiracy and obstruction of justice. The president was also named an unindicted coconspirator, although this was kept secret in the hope that he would agree to give up the tapes. In April the special prosecutor and the House Judiciary Committee, which was beginning an impeachment inquiry, issued subpoenas for the White House tapes. Nixon, on national television, announced that he would release transcripts of most, but not all, of the tapes requested. The transcripts provided damning evidence of the cover-up activities in the White House, but there was still no direct evidence that Nixon himself either ordered the Watergate crimes or attempted to obstruct the investigation—the "smoking gun" that Republican defenders of the president on the Judiciary Committee demanded to see. In district court Judge Sirica upheld Jaworski's subpoena. The president refused to comply, and the special prosecutor then appealed to the Supreme Court. The final act in the Watergate drama had two scenes, one played before the Supreme Court and the other played on the nation's television screens as the members of the House Judiciary Committee considered the issue of impeachment. A Democratic-controlled committee would be "trying" a Republican president at the bar of public opinion. Its actions must not be, or seem to be, partisan or vindictive. Yet it had no conclusive evidence that Nixon had committed or conspired in criminal activities. The fact that his aides had done so would provide shaky grounds for impeachment. The Constitution provides that a president is to be impeached for committing "high crimes and misdemeanors" but does not define these offenses. During the impeachment trial of Andrew Johnson in 1868, Democrats argued that the offense must be an indictable crime; Republicans broadened the definition to include abuse of power and failure to execute the laws and the Constitution. But in 1974, Republicans, including the president, opted for the narrow definition, while Democrats argued that the broader definition would be correct. The Judiciary Committee, denied access to the tapes by Nixon, could not prove that he had committed an indictable crime, although it did have tapes in which Nixon and Dean had discussed the possibility of bribing the burglars to ensure their silence. Beginning 9 May 1974, the committee heard testimony behind closed doors for eleven weeks, during which Chairman Peter Rodino of New Jersey and staff director John Doar presented the members of the committee with a pattern of misuse of presidential power. Most members were prepared to recommend the impeachment of Nixon for abuse of power, but a group of diehard Republicans still demanded evidence of indictable crimes. In late July the committee held televised hearings so that its members could explain their reasoning to the public. On 27 July 1974, the Judiciary Committee voted to approve the first article of impeachment, which centered on the burglary and cover-up. On 29 July it approved a second article condemning the abuse of power that involved sensitive government agencies such as the IRS, FBI, and CIA. The next day a final article, condemning Nixon for failure to comply with a subpoena to give evidence to the committee, was also approved. The next step would be for the committee to report its findings to the full House. Meanwhile, at the Supreme Court, Special Prosecutor Jaworski had pleaded for access to the sixty-four tapes withheld by Nixon on the grounds of executive privilege. On 24 July, in a unanimous decision, the Court held, in United States v. Nixon , that executive privilege was something to be defined by the courts, not the president. In the absence of a valid claim of national security, executive privilege could not be used to withhold evidence from a grand jury about possible criminal actions. Nixon would be forced to turn over the tapes. On 5 August (after the House Committee had voted to recommend three articles of impeachment), he released the tapes to Jaworski. These contained the conversation of 23 June 1972, in which Nixon had discussed the plan to use the CIA to head off the FBI's investigation of the burglary. It was now clear to the nation that Nixon had known about the burglary's connection to the White House and had attempted to use federal agencies to obstruct justice in a criminal matter. Nixon had violated the law and committed an indictable offense. The smoking gun had finally been found. Nixon now had only two options: he could fight a losing battle against an impeachment vote in the House and drag the nation through a trial in the Senate, or he could resign. After consulting with his closest aides and Senate Republican leaders, he chose to resign. On 8 September his successor, Gerald Ford, pardoned Nixon for all crimes he may have committed during his term of office, blocking any subsequent inquiry into his conduct in the Watergate affair, but Nixon did have to pay back taxes of $467,000 for taking improper deductions on his income tax returns. This is a great and organized well thought over piece. Good Job!!!! I will reccomend this site to my friends and relatives!!!!!!! THIS ARTICLE IS FRICKIN' AMAZING! i love learning about awesome stuff like this! Johnson, Lyndon B. Ford, Gerald R.